Written by Jacques Derrida's leading English-language translator and collaborator, this invigorating and intelligent volume displays the continuing power and versatility of deconstruction, presenting it as the most important intellectual movement of our time. Geoffrey Bennington develops a devastating critique of many attempts to clarify or criticize deconstructive thought, and elaborates its potential through original readings of, amongst others, Rousseau, Kant, Hegel, Freud, De Man and Lyotard. 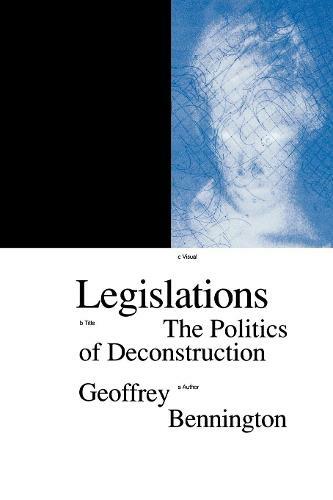 While he is principally concerned with a defence of deconstruction in fields where it has long since demonstrated its critical prowess, Bennington also emphasizes its political dimension. Deconstruction is a political thinking, he argues, because it entails an irreducible opening to alterity (if only in the form of reading); and this opening, where the other always might arrive as an event on the frontier of my experience, is a place for legislation.